Hearts are favorites here at Virgo Moon so there was no way I could pass up this pretty Ruby heart! 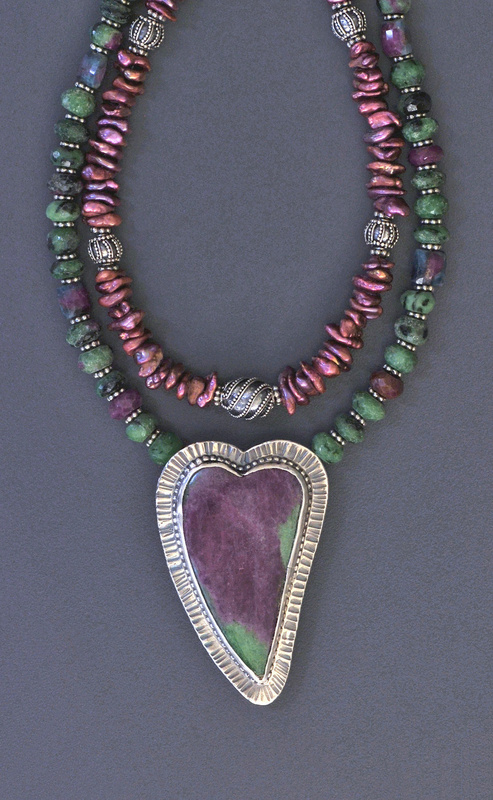 The material is listed as "Ruby Zooisite," but we know that was a typo, it is Ruby in Zoisite, ... or is it? One sees similar, more pale stones labeled Ruby in Fuchsite. Are they the same thing? There's a short article on the subject on geology.com which shows the differences between the two clearly. We can see from the article that our beads and cabochon are in fact Ruby in Zoisite because 1) there is no blue Kyanite corona around the ruby as there is when it occurs in Fuchsite, and 2) the beads plainly show characteristic scattered black Hornblende crystals typical of Zoisite. Ruby in Zoisite is also known as Anyolite, defined by Wiki as a metamorphic rock consisting of intergrown green Zoisite, black/dark green Pargasite and Ruby. Wait, where did Pargasite come from? It turns out 'Hornblende' is not a mineral but rather a general term referring to a dark amphibole. Well that clears it up... or not. What's an amphibole? Pargasite is in the amphibole group of inosilicate minerals. So our sources concur, and it's clear we have a lot more to discover about the chemistry and physics of the inosilicate minerals, but I'll leave that as an exercise for the reader. That leaves the question as to why this is called "Ruby in Zoisite" instead of Anyolite. Marketing I assume. Does Anyolite sound desirable in any way? Wouldn't you rather have a Ruby than "any 'ol lite"? Of course! However I can hear you saying: if it's a ruby why isn't it crystalline, why isn't it faceted? Here at Virgo Moon we find faceted stones lovely but less exciting than a gorgeous one-of-a-kind impressionistic painting by our own Mother Earth. Just think of it! She chose these remarkable colors to give us this dreamy scene on a tiny little canvas. 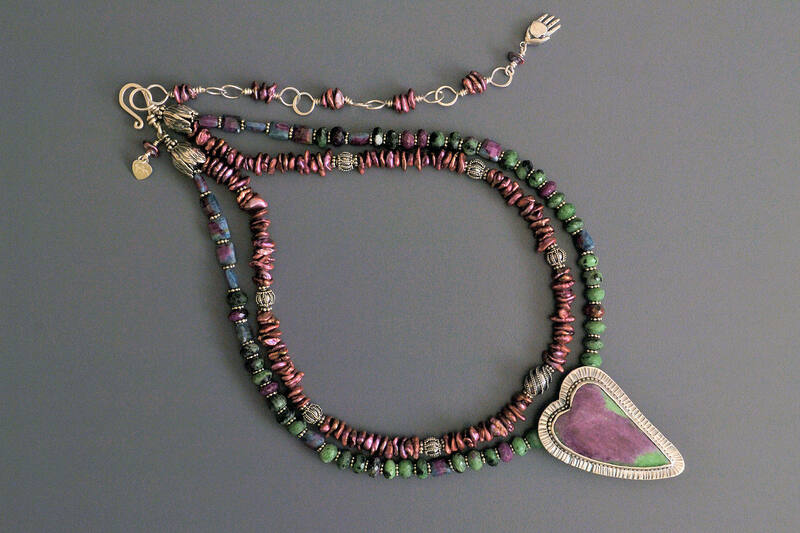 And she didn't stop with a pretty picture, she infused the supposedly inanimate stone with subtle and balanced energies which warm the heart and stimulate healing. As a child of the '60s (you knew that), I often hear Buffy St. Marie reminding me, "God is alive, magic is afoot/God is afoot, magic is alive/..." Perhaps this little stone will act as a receiver with which you too can tune into those old radio frequencies where her passionate song still resonates. Seriously, if you're too young to remember, give a listen to Buffy's stunning performance of "God is alive" on YouTube. Get lost in Leonard Cohen's reading of his own poem, then listen again to Buffy. He wrote it, she lives it. And please remember to come back here afterwards! 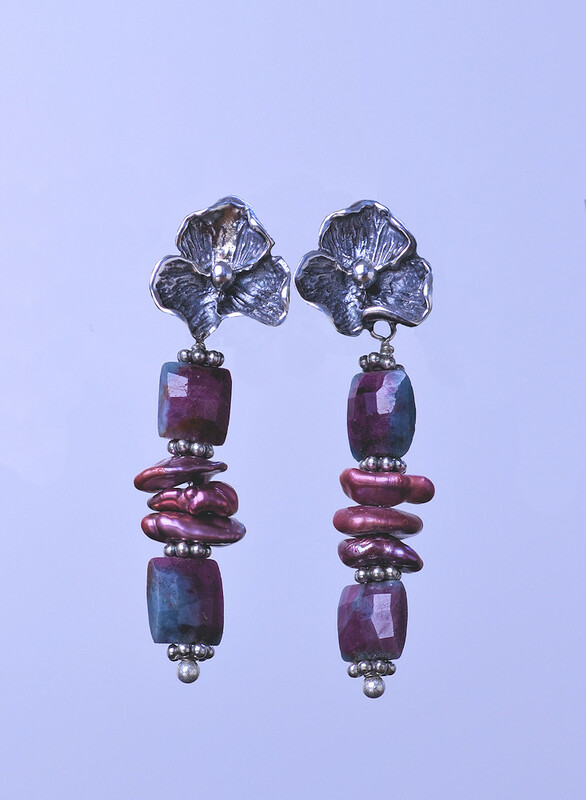 "Ruby symbolizes all things hot, active and passionate" Judy Hall contends. 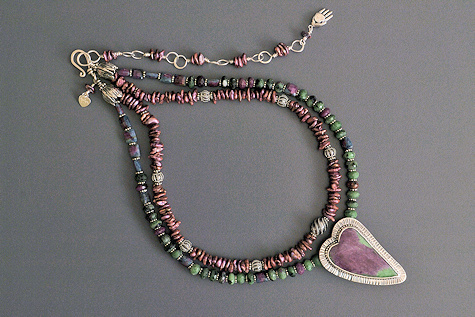 The stone is softened by Zoisite's temperance and selflessness. 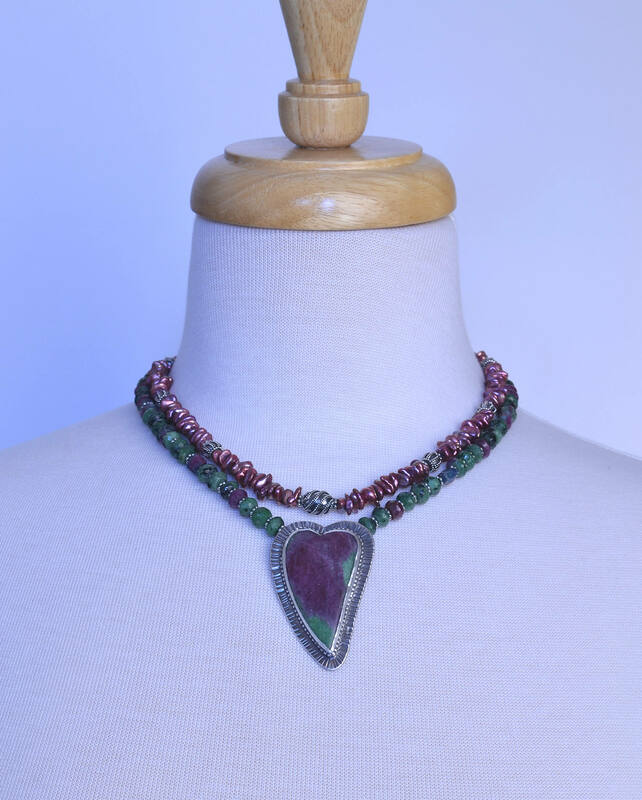 Ahsian sums it up this way, "When Green Zoisite is naturally intergrown with Ruby, a truly beneficial energy combination occurs, in which the healing qualities of Zoisite are energized and augmented by the intense life-force energies of Ruby." So, whether you are a person who has already plugged Al2O3 (Ruby) and Ca2Al3(SiO4)Si2O7)O(OH) (Zoisite) into ChemDoodle to see how it might be possible for them to "intergrow," or if you put Buffy on infinite replay after reading this, or if the energy in this stone reaches you through its picture, or if you love one-of-a-kind deep pink and green stones and heart jewelry, this piece must be for you! I hope you will order it, there can't be another.